JHARKHAND HIGH COURT Before :- V.K. Gupta, CJ. For the Petitioner :- Mr. S.L. Agarwal, Advocate. For the Respondent :- Mr. A.S. Dayal, Advocate. V.K. Gupta, C.J. 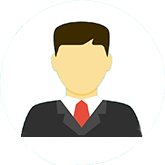 - This case arises out of a criminal complaint, (C/1 Case No. 353/2001) filed by Mrs. Sarbjit Kaur against the petitioner under Sections 406 and 420, 1PC. The petitioner's contention is that in this criminal complaint, the learned trial court has taken cognizance of the offence under Sections 406 and 420, IPC and issued process against the petitioner, by summoning the petitioner (through issuance of summon) to appear in the trial Court. Admittedly, the court below has not issued any warrant of arrest, bailable or non-bailable, against the petitioner. The petitioner has been called to appear in the trial Court only through the issuance of summons. The petitioner's apprehension is that since the cognizance has been taken for offences punishable under Sections 406 and 420, 1PC and these being non-bailable offences, as and when the petitioner appears in the Court below, the Court below may refuse to enlarge the petitioner on bail on the ground that the petitioner is accused of committing non-bailable offences. It is under these circumstances that the petitioner applied for grant of anticipatory bail before the learned Sessions Judge, who however, dismissed the same, vide order dated 4.7.2001, under challenge in this petition. 2. After hearing the learned counsel for the parties, I am of clear opinion that if an accused-person appears in a trial Court after having been served the summons, after the trial Court has taken cognizance of the offence in the complaint, whether, the cognizance is with respect to bailable or non-bailable offences, because summons in the first instance have been issued for appearance of the accused, in normal circumstances, on the date the accused appears in the trial Court, he should be enlarged on bail by accepting the bail bond alongwith the surety bond furnished by the accused. Actually, I may even go a step further and hold that even if the trial Court, after taking cognizance as aforesaid in a private complaint, issues bailable warrant of arrest against an accused even with respect to alleged commission of non-bailable offences, if the accused appears in the trial Court in such a private complaint after execution of such bailable warrant of arrest, unless in the opinion of the trial Court, for the reasons to be recorded in writing, the denial of bail is clearly warranted in the facts and circumstances of the case, in normal conditions and in normal circumstances, the accused should be enlarged on bail. Of course, in respect of those offences, which are either quite serious in nature or are heinous, and where on well-established legal norms and parameters, denial of bail is a rule, the accused should not be enlarged on bail, but, with respect to such offences which are neither so serious not heinous, such as cases which are in the realm of either civil disputes land where cognizance has wrongly been taken) or such minor offences where punishment, even if ultimately awarded, may not be death sentence, or life imprisonment or imprisonment exceeding 7 (seven) years or thereafter, in a private complaint relating to such offences, the trial Court should, in normal circumstances, on the date the accused appears in execution of the process issued against him, should accept the bail bond of the accused along with the surety bond and order his being enlarged on bail. 3. On the question of grant of bail to accused I may also observe that there is another category of offences, where normally bail should be granted and refusal should be an exception. I am talking of offences under Section 498A, IPC and Section 4 of the Dowry Prohibition Act, 1961. My experience has shown me that invariably in almost all cases relating to the alleged commission of the aforesaid offences, whether lodged on police report or through a private complaint, the accused are denied bail. Just because the police report of the private complaint carries with it the label of Section 498A, IPC or Section 4 of the Dowry Prohibition Act, 1961, does not mean that the bail should be denied to the accused. In relation to the aforesaid offences only if a Court finds that there are very serious allegations against the accused, his involvement and simplicity in the commission of offences being directly linked with the facts alleged and either it is a very blatant and serious allegation of immediate and proximate demand of dowry, or if the offence relates to Section 498A, IPC, there are serious allegations supported with clear proof, that indeed physical injury has been inflicted upon the alleged victim, only in these cases, rejection of the bail may be resorted to, and its grant should be an exception. Of course, in those cases where it is manifestly clear, on a plain reading of the police report or the contents of the private complaint that neither any grievous injury has been inflicted upon the alleged victim nor is there any other clear proof of the alleged victim having physically suffered and that there is also no serious allegation supported with positive proof of dowry having been demanded in the immediate proximity of the marriage or thereabout, the bail should be granted. It happens quite often that in ordinary matrimonial disputes or where there is some discordant note in a matrimonial relationship, the woman as an alleged victim sets in motion the machinery of law by invoking Section 498A, IPC or Section 4 of the Dowry Prohibition Act, 1961. The Courts should, therefore, be circumspect and careful, while considering the question of grant or refusal of bail, to find out whether there are indeed genuine and serious allegations and only then, if it does find that such allegations exist and are clearly made out, should bail be refused to the accused-persons. Similarly, while considering the request of the accused-persons for bail in such cases, the Court should also find out whether a particular accused had any role to play in the transaction or in the occurrence and whether. in the background of the facts and circumstances, there are any probabilities of his having played such a role, regard being had to the relationship of such an accused with the main parties, such as the husband, or the in-laws of the alleged victim. While considering all such aspects with relation to the question whether to refuse bail or to grant bail, the courts, therefore, should be very careful in also assessing with reference to the contents of the police report or the complaint, the nature of the allegations made, the supporting proof and documents etc. to find out whether the prosecution, the defacto complainant or the informant are trying to unnecessarily harass the accused and jeopardize their interest and if in fact, there are grounds to believe that an offence has been committed. It is only in the latter case that the bail may be refused. In former case, the grant of bail should be a rule. 4. Based on the aforesaid observations, therefore I find that apprehension of the accused-petitioner is not well founded. The application for anticipatory bail accordingly is dismissed. The accused-petitioner is at liberty to appear in the court below (Sri O.P. Pandey, Judicial Magistrate, Jamshedpur, in C/I case No. 353/2001 and apply for being enlarged on bail. If he does so, the trial Court shall pass appropriate orders in the light of the observations made hereinabove. 5. 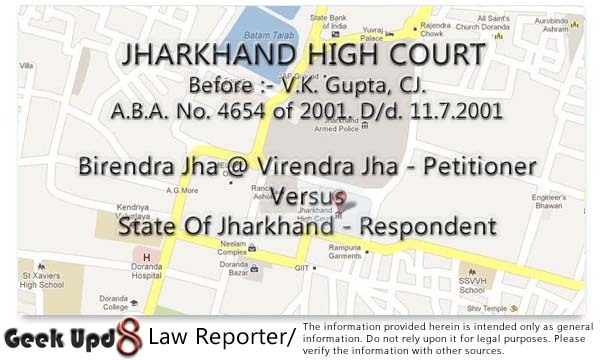 Registrar General of this Court is directed to circulate copies of this judgment to all Subordinate Courts in the State of Jharkhand for their information, compliance and necessary action.